The addition of a small Jalopnik sticker on a race car is believed to have mystical qualities that propel you to the front of the field. This weekend, we’re seeing if the mighty Jalopnik bump works on a group of Honda employees’ epic side project: the No. 69 Honda of America Racing Team Acura NSX GT3. HART had been running No. 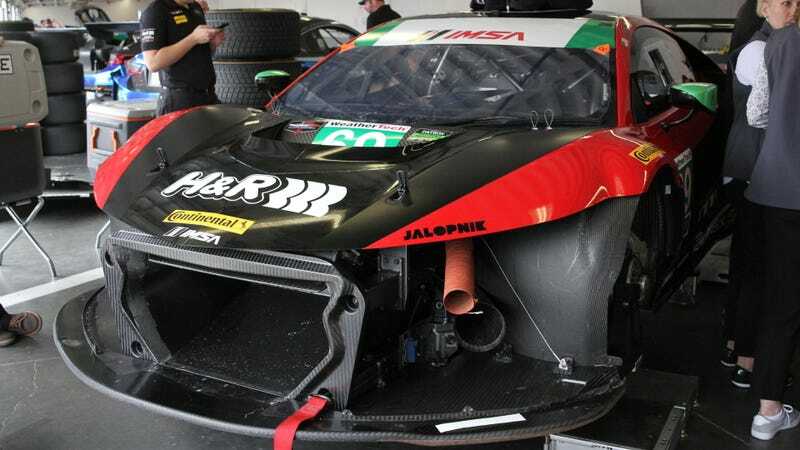 93 on their cars before moving into the main show for the North American Endurance Championship, but that number had already been claimed by the Michael Shank Racing Acura NSX GT3 team. So, they went with a number they’d previously won with: 69. We want to make sure the No. 69 has a very nice shot at the win here in their first 24 Hours of Daytona, so we gave them my last Jalopnik sticker (until I can get more) while they were working on the car this afternoon. I have to say: it looks nice.